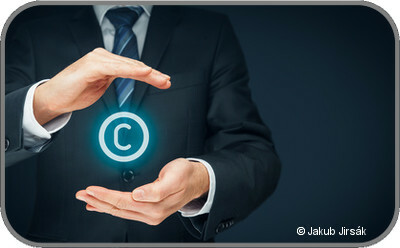 Translated, the term copyright basically means the same thing as the German “Urheberrecht”, however, there is a legal difference: While the German “Urheberrecht” protects both the ideal as well as the economic interests of the originator, copyright safeguards the rights of the owner to the property of the work. The copyright notice – protection or simply a symbol? The notice used to be necessary. In the United States for example, copyright had to be registered and marked with the copyright symbol. If this did not occur, there was a risk that the rights to the work would lapse. This is probably why the copyright notice, which actually never had a legal effect, was used so often at the time. Since the changes in the law in the United States in 1989, works are now immediately protected; the copyright symbol is therefore obsolete. Can a copyright symbol be used anyway? The notice is not legally required; the copyright occurs on its own and does not need to be activated by the symbol. However, for the protection and prevention of one’s own claims it can be sensible to place a copyright symbol. For instance when a self-written text or a logo you have designed appears (nearly) unchanged on an external homepage. If the text or logo are provided with a copyright notice – and possibly also with the legal consequences – this can serve as clarification and also act as a deterrent. But if someone should make use of your work you can demand compensation for damages. However, the “thief”, the so-called infringer, must have acted deliberately or negligently. If texts, images or logos include a copyright symbol, excuses such as “I did not know” do not count. It is then obvious that the infringer has acted deliberately and the indemnity payment is generally higher.